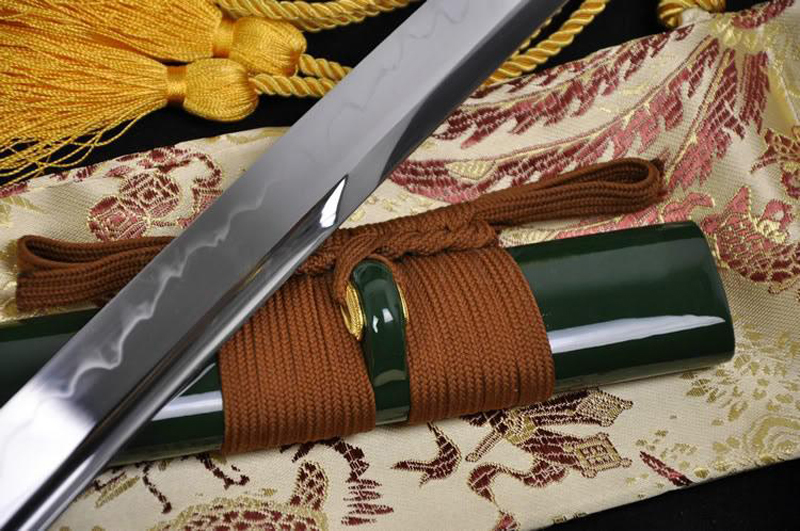 Shinogi-Zukuri (diamond-shaped kissaki) is the most common of a Japanese sword, also Unokubi-Zukuri (Cormorant's Neck) blade design (also called Nagamaki Naoshi) has gathered a large amount of followers. The Unokubi-Zukuri Katana provides excellent balance in a strong cutting blade. The term unokubi literally means "neck of the Cormorant" which refers to the deep scoop on the shinogi ji of the last 2/3 thirds of the blade while leaving the kissaki shape intact, which is a short bo-hi with a diagonal termination. This geometry was initially designed to lighten the blade of a naginata while keeping most functionality intact. This kind of design is a nice one for a ‘cutter’ as it allows the blade to be tall and rather strong from edge to back and of reasonable thickness at the shinogi without being overly heavy since the shinogi ji's angle back to form a very thin mune on the 2/3 thirds of the blade.